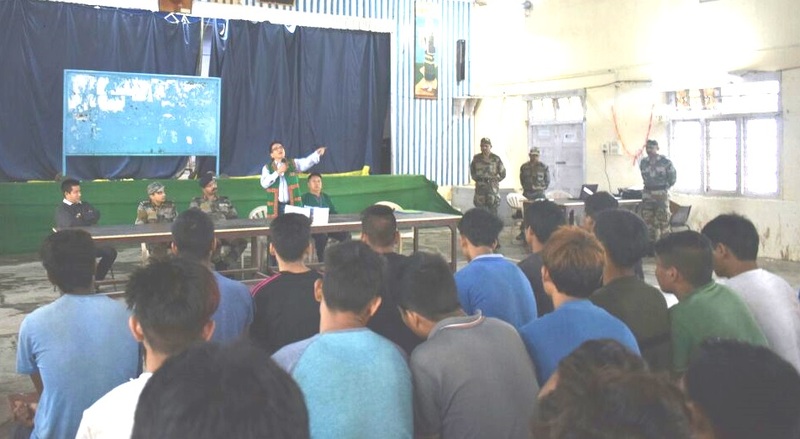 PASIGHAT, April 14: Over 100 local youths from East Siang, Siang, Upper Siang, Lower Dibang Valley, West Siang districts have registered for the training have registered at Pasighat for Pre-recruitment Training to join Indian Army. The training is being conducted at JN College Pasighat, coordinated by AAUN Foundation in association with Military Station Sigar and East Siang District Administration. The youth were motivated by Deputy Commissioner Tamiyo Tatak, Colonel Ankur Kulin of Military Station Sigar, Vice President AAUN Foundation Tabung Ering and Group Captain M Panging VM Retd, Secretary AAUN Foundation. The final recruitment is planned at Jairampur during 10-13 May next. Similar Pre-recruitment training was carried out a few months back by AAUN Foundation in association with Military Station Sigar and eight local youth were selected for recruitment to Army. Secretary AAUN Foundation, Group Captain M Panging VM Retd informed that the District Administration is providing support and all candidates are being given refreshments and reading/writing materials. He also informed that this time focus is more on theory classes for written tests as last time most candidates could not qualify in the written tests. More classes and written tests are being conducted to prepare the candidates. It is expected that more youth will get selected this time. Selection of more youth from Arunachal Pradesh to join Indian Army will provide gainful employment to local youth and strengthen national integration.